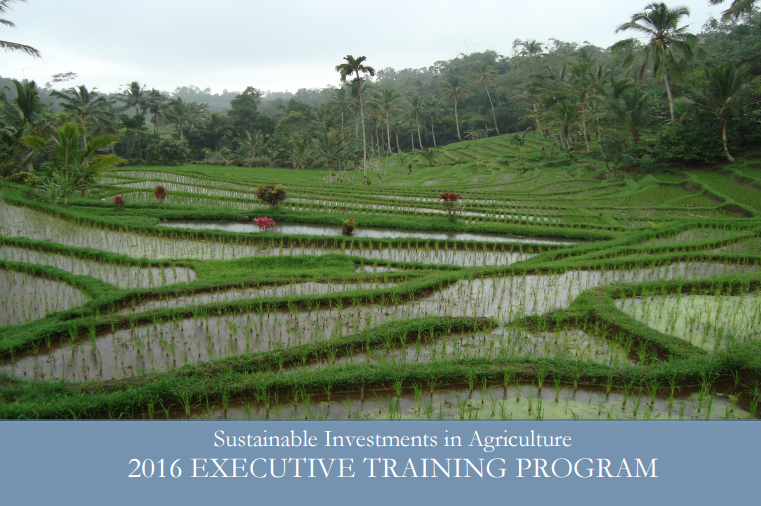 The Columbia Center on Sustainable Investment (CCSI) is pleased to announce that applications are open for our Executive Training on Sustainable Investments in Agriculture, which will be held at Columbia University from July 6-15, 2016. This interdisciplinary, executive-level training course is designed primarily for public sector officials and civil society representatives from low- and middle-income countries, whose responsibilities relate to investments, agriculture, land, or rural development. A select number of representatives from the private sector and development agencies may also be admitted. ensuring that investments are gender-sensitive, transparent and respect human rights. The goal of the course is to build the knowledge and skills necessary to support responsible agricultural investment, and to facilitate knowledge sharing among the different countries represented at the course. This second annual program follows the highly successful inaugural program, which took place in March 2015. You can find more information, as well as feedback from past participants, in the program brochure or on CCSI's website. If you are interested in participating in the training or know of qualified candidates, please visit CCSI's website for the application materials and additional details about the program. The program fee for the eight-day training is USD $3,750; this covers lectures, accommodation, breakfast and lunch, and social events. (For participants who organize their own accommodation, the fee is $2,000). Participants will receive a Statement of Attendance from Columbia University. The deadline for applying is March 25, 2016; applications will be evaluated on a rolling basis.